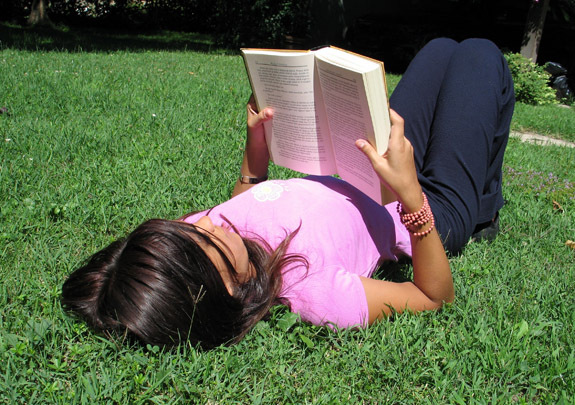 Summer Books: Why Summer Books? We think it just makes sense to accept books that aren't being read and give them to kids who want to read them. We also recognize the achievement gap that exists between readers and non-readers. Researchers have investigated this gap and they've found a clear explanation. Richard Allington, Ph.D. and Anne McGill-Franzen, Ph.D. summarize their findings in "Why Do Poor Students Lag Behind Rich Students in Reading Development." What has become clear over the past 35 years is that low-income students learn as much during each school year as do middle-class students (Alexander, Entwisle & Olson, 2007: Hayes & Grether, 1983; Heyns, 1978). But every summer, when school is not in session, kids from low-income families lose two or three months of reading growth, and middle-class kids add a month of reading growth. This means that even when schools for kids in both high-income and low-income families are equally effective, summer reading loss widens the reading achievement gap that existed when these children began kindergarten. Why is there this family economic trigger that creates summer reading loss, and is there a way to neutralize that trigger and end the summer reading loss that kids in low-income families experience? The answers to this two-part question are now reasonably clear. Students from lower-income families experience summer reading loss because they don’t read much, if at all, during the summer months. Students from middle-class families, on the other hand, are far more likely to read during this same summer period. Low-income students don’t read during the summer months because they don’t own any books, and they live in neighborhoods where there are few, if any, places to purchase books. We organized spring book fairs in 17 high-poverty elementary schools (between 400 and 600 book titles were available at each book fair) and randomly selected roughly 1,000 students to self-select the 15 books they would be given on the last day of school, just as summer vacation began. We also selected a similar number of children to serve as control students. These kids did not get any books on the final day of the school year. The children were completing either 1st or 2nd grade when we began the study, which then ran for three consecutive years. When the study began, the two groups were at similar levels of reading development. But after three consecutive summers of easy access to self-selected books, the kids with access to books read significantly better than the control (no books) kids. The difference between the two groups’ reading development was roughly a half-year. In other words, providing poorer students with easy access to books literally ameliorated summer reading loss! As fulfilling as this result was, we found it even more fulfilling that the achievement growth of the poorest students (those eligible for free lunches) was twice as large as the general effect. This effect and the effects others have reported indicate that it is primarily the children from low-income families who benefit from summer book distributions (Allington, McGill-Franzen, Camilli, Williams, Graff, Zeig, Zmach & Nowak, 2010; Kim & Quinn, 2013; White, Kim, Kingston & Foster, 2014). It is also important to note that the gains in our summer book distribution study were as large as the typical gains generated by attending summer school (Cooper, et al, 1996). Of course, our project cost much less than summer school attendance. Roughly $50 per child, per summer, is what it cost to run the book fairs and summer book distribution. It is also important to note that we did not require students to write book reports or take quizzes on the books they selected. All we really did was create a process such that children in low-income families were given easy access to books they wanted to read during the summer vacation period. The above study is our inspiration. We believe we can make a tremendous impact by doing something very basic. By simply providing students with free books of their own choosing, we can create lifelong readers and make a difference in students' reading abilities. This is why we want your donations. Every child should have access to books to read for the summer. The research tells us that if they do, they can achieve just as much as their classmates. You have the power to help them do that.